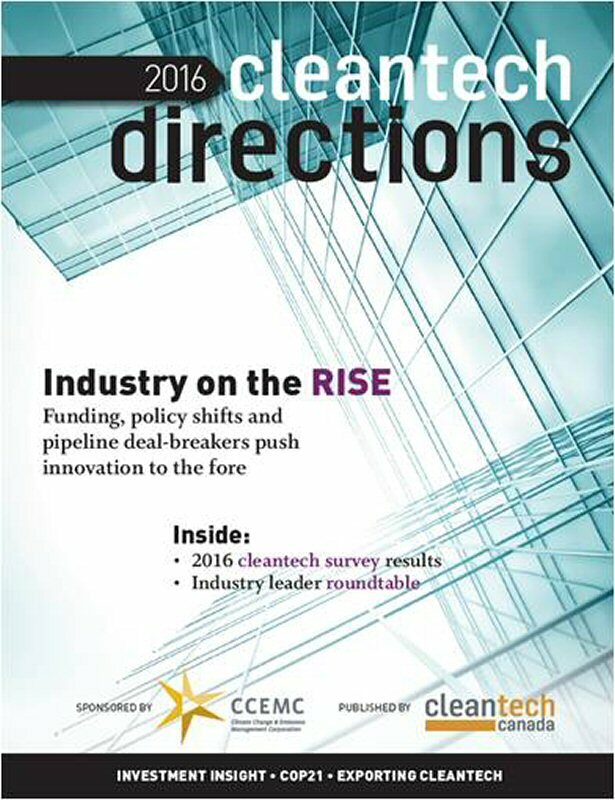 Cleantech Canada, a national media brand focused on business sustainability and clean technology trends, is releasing its 2016 Cleantech Directions industry report at the Globe environmental conference in Vancouver this week. Conducted in partnership with the Edmonton-based Climate Change and Emissions Management Corp. (CCEMC), the report presents findings from a survey of 500 Canadian Cleantech executives and demand-side organizations; combined with insight from a panel of industry insiders. It illuminates opportunities for Cleantech growth, barriers and calls to action, and key drivers of innovation in the Canadian economy. 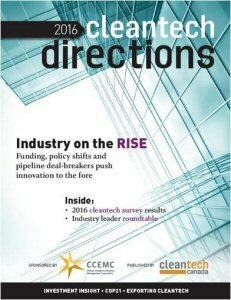 Stage of development: 64 percent of Cleantech companies surveyed are generating revenue; 20 percent are in pilot/demonstration; 16 percent are in the test or research phase. Confidence: 79 percent are confident their business will reach the next stage of growth within two years. Location: 72 percent feel Canada is a good environment to grow a Cleantech business. Pitch: Only 30 percent are very confident in the quality of their investor and customer 'pitch'. Investment: On the demand side (organizations buying or evaluating clean technologies), energy efficiency was cited as the top priority for investment (47 percent), followed by waste management and recycling (35 percent), water management (23 per cent) and clean energy (22 percent), among other areas. Innovation gap: Though 60 percent of respondents agree innovation is an important cornerstone of their overall business strategy, only half (50 percent) currently have partnerships with academic or research institutions. The report was produced with support from the CCEMC, along with Alps Welding, Alberta Innovates Bio Solutions, BioFuelNet Canada and getcleantech. Panel participants represented organizations such as MaRS Discovery District, City of Toronto, Delphi Group, Natural Resources Canada, CrossChasm Technologies, Eyedro Green Solutions Inc. and others.